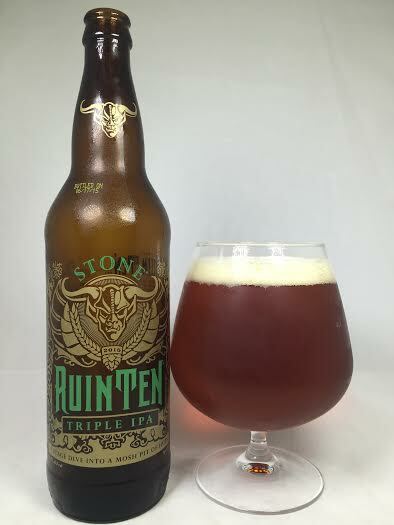 Back in 2012, Stone released a 10th anniversary edition of their Ruination IPA. It was met with much acclaim and made numerous "Best of" lists for 2012. Naturally, with demand sky high, Stone made the beer a yearly release and renamed it "RuinTen". I never got my hands on the original 2012 batch, but I've had it every year since and am usually disappointed as I think it is nothing more than a glass of sticky resin. So here we are once again with the newest batch for 2015 to see if I can still be persuaded. The aroma is overpowering resin, but also rather sweet as well. I remember the last time I had RuinTen and it was an unpleasant resin nuke of a beer. This time around, what appears to be a larger malt presence has added a significant amount of sweetness to balance out the obscene amount of hops. When I say obscene amount of hops, I do mean you are practically scraping them off your teeth as dank bitterness is here in the beginning, middle, and end. Hop resin and oil are also combined with pine and tree sap to give an East Coast kick to this beer. What sets it apart from previous incarnations of RuinTen is how sweet is it. An almost sugary, sticky sweetness is not cloying or all that syrupy as I was expecting, but instead it has brought a zen-like balance to this massive IPA. As a 10.80% "Triple IPA", I'm amazed that there isn't even the slightest hint of alcohol. When you venture into the "Triple IPA" category (an IPA 10% or higher), you expect the body to get syrupy or thick, but RuinTen drinks more like an 8.0% Double rather than a double-digit IPA. Some nice carbonation moves everything along. There is a noticeable lingering resin on the finish, but it's not that bad considering how big the beer is. As I said before, no alcohol taste, but even pushing 11.0%, there isn't even any warmth on each swallow and I am easily killing my entire bomber. It isn't even that dry on the finish. I'm impressed. Coming into the 2015 RuinTen, I will admit that I had a bias against not just this beer, but Stone IPA's as a whole. I'm not sure if they re-worked the recipe (even though they said they didn't) or if I just have several more years of drinking under my belt and can approach this from a new state of mind, but this is an incredible "Triple IPA". With IPA's this big, drinkability is arguably the #1 concern, and this has passed that test with flying colors. The amount of hops in this is absurd, but it's not a challenge to put down thanks in large part to the equally sweet malt presence. This one is most definitely a palate destroyer in every sense, but it's also smooth going down and flavorful. I know "Triple IPA" is not an official style, but this is definitely at the top of that class.